Supply chains are what make the world go round. The food you buy at a grocery store was carried through a supply chain. Same with the products at your local corner store, and the clothes you buy in the mall. A supply chain is nothing more than the process of carrying goods from manufacturer or producer through a series of checkpoints until eventually reaching a distributor—and ultimately, a consumer. The problem with most supply chains, however, is everything that happens in the middle. Companies know where things start and where they end up. But how they get there, and what happens between each checkpoint, is relatively unknown. Food is an extremely sensitive product. It needs to be carefully handled, it needs to be kept within certain temperatures to ensure quality, and it needs to be tested so that spoiled orders don’t end up at a grocery store deli counter—or served in your Chipotle bowl. The challenge with adhering to all these regulations comes down to the fact that many of the processes that make up a food product’s supply chain are severely outdated. They are done manually, with orders being tracked by warehouse workers. And what happens if a shipment falls outside a certain temperature bound somewhere along the way? Is it considered spoiled? Is it still fine to move along to the next checkpoint? Should it be sent back to the original supplier? The truth is, these decisions are made ad-hoc and left to human decision, when in reality, we have the technology today to automate almost every single portion of a supply chain’s process. It’s called Blockchain, and major producers are already beginning to experiment with the technology. Take Walmart and IBM, for example. In China, Walmart has already started utilizing blockchain tech to closely monitor shipments of pork and ensure quality control. This process is the result of Hyperledger, which is an open source software project hosted by The Linux Foundation specifically for blockchain tools that IBM contributes to. And one of the biggest benefits they stated for implementing blockchain tech into their supply chains is its potential for consumer transparency. With blockchain, every step of a food product’s journey can be effectively tracked and stored as data. But it’s not just big brands that are dipping their toes into the blockchain space. Supply chains are everywhere, and according to KPMG, 40% of global manufacturers lack information and material visibility across their supply bases—which is a huge problem. This means products are delivered without any real insight as to whose hands they touched along the way. Why this happens ultimately comes down to outdated freight shipping practices. Freight can move in a number of ways: air, truck, sea, train, etc. However, all those middle-men between original manufacturer and end distributor tend to be third parties with little direct involvement to the company whose name is on the box. Other pain points include shippers not wanting to coordinate with multiple drivers, difficulty in monitoring logistics, price unpredictability, and high mark-ups from brokers. 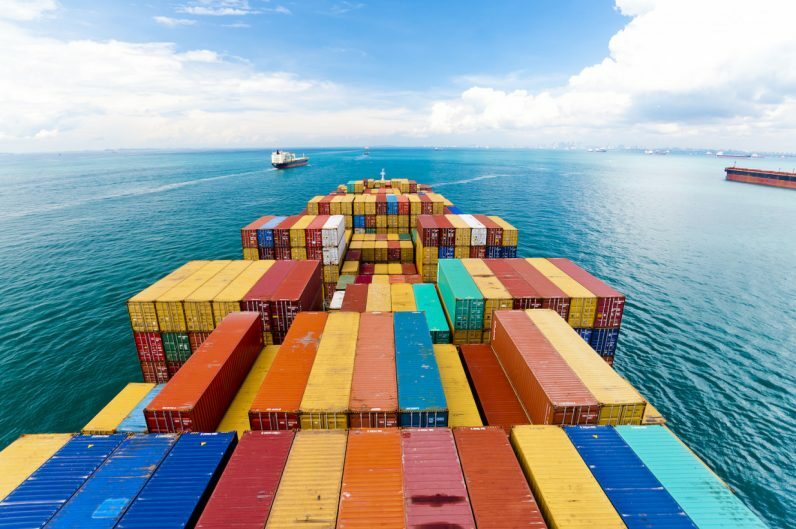 One startup that is looking to solve many of these logistics issues is ShipChain, leveraging blockchain technology to integrate a fully transparent system across a company’s entire supply chain. In the case of food, this would entail tracking everything from the farm all the way to the end consumer’s moment of purchase. ShipChain is one of the first blockchain startups to tackle such a big issue, and have already signed on Perdue Farms to begin leveraging the platform. With ShipChain, Perdue will be able to know how and where any single product is along the supply chain by utilizing encrypted geographic waypoints tied to ShipChain’s Smart Contracts. This is what allows shippers to receive more visibility, and carriers the ability to communicate more easily and reduce delays. All data will then be stored on the blockchain, with completed contracts automatically completed and recorded upon delivery and confirmation. It’s the Smart Contract system of blockchain technology that makes it so appealing for major companies with hundreds of thousands of shipments floating across their supply chains. These contracts can be automated to fulfill payments to parties upon effective delivery, drastically reducing hours of labor doing so manually. Truthfully, this is only the beginning for the supply chain industry. And if companies like ShipChain are any indication of where things are headed, then this is only the beginning. Read next: Do Android phones now need Face ID too?